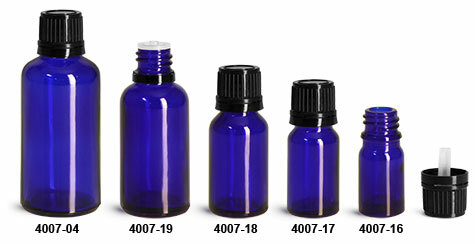 Blue glass euro dropper bottles pair nicely with black tamper evident caps, offering a visually appealing display, while also protecting products from UV rays and oxidation. The black tamper evident caps include dropper inserts with a 1 mm orifice for a controlled pour, and tamper evident rings that detach after the first opening. These blue glass bottles could be a stylish and durable packaging choice for an array of products.